That a pop band should turn 40 is an event. All the more so when this band is called Kraftwerk and is the most influential musical group that Germany has ever produced. At any rate, Kraftwerk has been much-acclaimed since their anniversary in 2010. Kraftwerk, however, would not be Kraftwerk had it not largely ignored its own anniversary. It had announced no endless tours and no deluxe re-edition of its hits. Melancholy retrospective seems alien to the band, alone on conceptual grounds. Kraftwerk stands for the modern, for progress. The amazing thing is that, even after four decades, the band can still represent these principles. There is no exact date for the band’s founding, but this much is known: Kraftwerk emerged in 1970 from the rather unsuccessful pop group Organization. The two founding members Ralf Hütter and Florian Schneider built up their now legendary Kling Klang Studio and recorded their first album. The revolution would still be a few years in coming, but the foundation was laid. Soon after initial experiments with Krautrock, Hütter and Schneider discovered the possibilities offered by new electronic sound generators. A first attempt with relatively catchy pop music failed, but then began a period in which the band racked up hardly any hits but countless pioneering achievements. Today whole legions of musicians cite Kraftwerk as their model and inspiration, two or three musical genres celebrate it as their founding father and David Bowie is its biggest fan. In their homeland they may be still be controversial, but abroad they are regarded as undoubtedly the greatest German contribution to the history of pop music. The influence of this contribution can still be heard today. The now classic tracks by Kraftwerk, whether the over thirty-year-old The Model or even the almost fourty-year-old Autobahn, today sound not only timely but even as if they had been transported for punishment from some distant future into the present. With their then not yet computer-generated but percussion-created and nonetheless machine-like rhythms, Kraftwerk anticipated in the 1970s a style of music that was invented only in the nineties: techno. An amazing achievement, especially when you consider that rock music then was dominated by long-hairs who lost themselves in endless solo improvisations and by their antipodes, the punks, who categorically rejected any too sophisticated craftsmanship. Kraftwerk belonged neither here nor there: their approach – to rid music of all unnecessary ballast, to work out its structural element and to conceive of the musicians as a mere appendage of the machine – was not only revolutionary, it was unique. Their music sounded like science fiction; in it the machines took power and the serialism of industrial production was finally translated into pop culture. The aesthetic rigor of their music exploded every prevailing musical convention. The idea of supplementing this radical concept with a consistent visual appearance was another innovation. Today the members of Kraftwerk still appear in uniform costumes, keep perfectly straight faces, show, like automatons, no sign of emotion. To press conferences, they sent cardboard figures or homemade robot dummies of themselves; to TV shows later digital avatars. For Kraftwerk, the artist no longer existed; they didn’t even call themselves musicians, but rather “music workers”. Or they called themselves “manmachine”. This concept influenced generations of musicians. The synthpop of the eighties, bands such as Depeche Mode or Heaven 17, would be inconceivable without Kraftwerk. Even the early producers of hip hop such as Afrika Bambaata loved Kraftwerk and sampled their futuristic sound extensively. Despite its incredible reputation, the band round the single remaining founder member, the now 63-year-old Ralf Hütter, is today still comparatively unknown, even controversial, in its homeland. 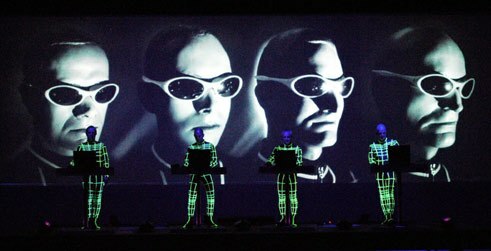 As late as 2000, when Kraftwerk was engaged by the organizers of the Hanover Expo to write its jingle, the group came under harsh criticism. Not only did the general public have difficulty identifying the computer voice that recites “Expo 2000” in various language as great art; above all the fee of 400,000 marks caused a stir. Even the then Chancellor Gerhard Schröder felt obliged to voice a judgment: “I wouldn’t have spent so much money for it”. Ten years later, the Chancellor was named Angela Merkel, Kraftwerk had turned 40 and the prophet had still not received the honor in his own land that he has long merited. That really was no reason to celebrate. Since 2011, however, Kraftwerk have been on a much-acclaimed tour – at first with three 3D concerts in Munich plus a 3D video installation at the Lenbachhaus gallery, in 2012 with six international concerts in total and 2013 with eight concerts per city in Düsseldorf (with an exhibition as well) and London. Thomas Winkler writes about pop music and culture for taz, Die Zeit, the Frankfurter Rundschau and other daily newspapers.